Now that you've been out in the field for one, five or 20+ years, you have probably identified a critical skill, process or technology that you wish you had known going into your career. Have you thought about sharing that skill or expertise with current students and other alumni? Or maybe you're interested in improving your facilitation and teaching skills? The School will be accepting Letters of Intent for a 2018 Humphrey Alumni in Residence program. 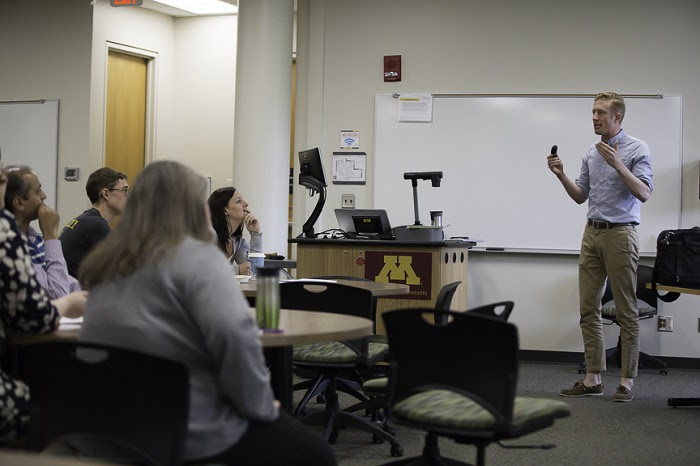 This pilot program will provide funding for Humphrey alumni to bring their on-the-job experience into the 'classroom' via a workshop, lecture, course, research, or other engagement. Outside of the box ideas are welcomed! We are leaving the options very broad in order to allow alumni to be as creative as they'd like in exploring what would be the most meaningful type of opportunity for them to participate in. Want to partner with another Humphrey alumnus/a? Go for it! Humphrey alumni living and working outside of the Greater Twin Cities are also welcomed to apply! Letters of Intent may be submitted starting on Monday, October 16, with a deadline of Tuesday, October 31 (no exceptions). All Letters of Intent will be reviewed by a committee of Humphrey staff, faculty, students and Humphrey Alumni Board members. A final selection will be contacted and asked to submit a full proposal in mid-November, and a final selection of Humphrey Alumni in Residence for 2018 will be selected in December. Depending on the number and type of projects/proposals received, there may be funding available for a number of Alumni in Residence for 2018 (TBD). Questions or need to email additional items? Please email Courtney Barrette, Manager of Alumni Relations & Annual Giving, at barr0396@umn.edu.